Aurora Legend is the latest title by Rastar Games, designed particularly for the casual gamers out there. At its core, it’s an adventure game with most of the elements that we’ve come to expect from titles of this genre. However, it also offers many features geared toward automation. In this sense, even those who don’t have much time to play can unlock most of the content with minimal interaction. Nevertheless, while this game is excellent for those on a tight schedule, there are still many things to do if you want to prevail after every battle. Luckily, players that are already familiar with the genre will find many of its staples in Aurora Legend. For instance, there are many RPG elements that exist in other games such as training your characters, leveling up, enhancing equipment, and learning new skills, to name a few. Furthermore, the game also has gacha elements in its summoning system, which is the main way in which you unlock new characters. However, in stark contrast with other adventure games, you will notice that Aurora Legend actually requires minimal interaction. It’s a game about micromanaging your team, setting up powerful compositions, and powering up your characters so that they can perform adequately in battle. However, once they’re out on the field, you won’t have to do anything else other than watching them fight and hoping that they come out on top. With that being said, this game requires a radically different approach than others. To this end, we have created this guide so that you can learn exactly how to get started on the right foot. 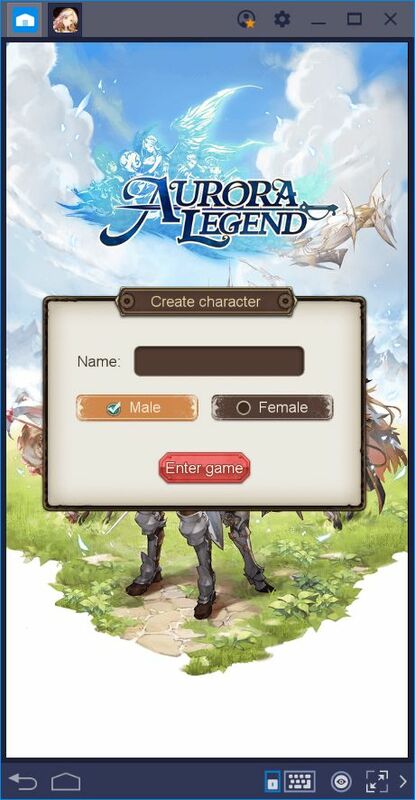 Once you’ve downloaded and installed the game, your first task will be to type your name and choose your gender. Once that’s done, you will be presented with a cutscene introducing the plot of the game. Feel free to read our review if you want to learn more about the backstory. 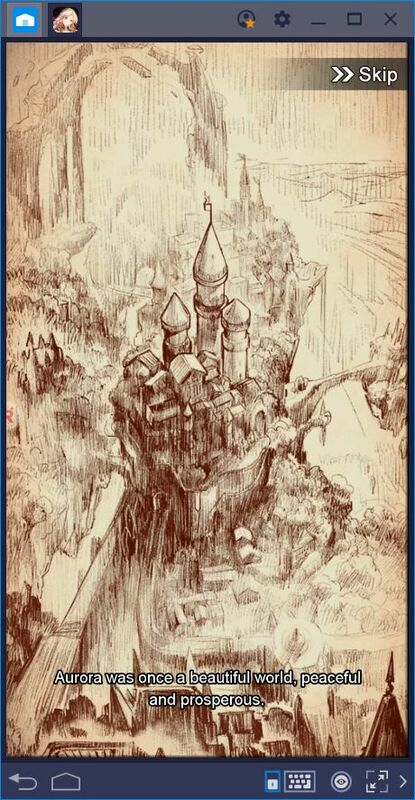 There’s a short introductory battle if you watch the cutscene, in which you will also learn about the legend that’s deeply rooted in Aurora’s Lore. If you skip the cutscene, you will also skip the battle and jump directly to the main menu. The tutorial here does a pretty good job of explaining how everything works at the start. However, due to the game’s automated design, it’s easy to get lost and feel like your decisions aren’t affecting much; that is, until you reach the first difficulty wall. 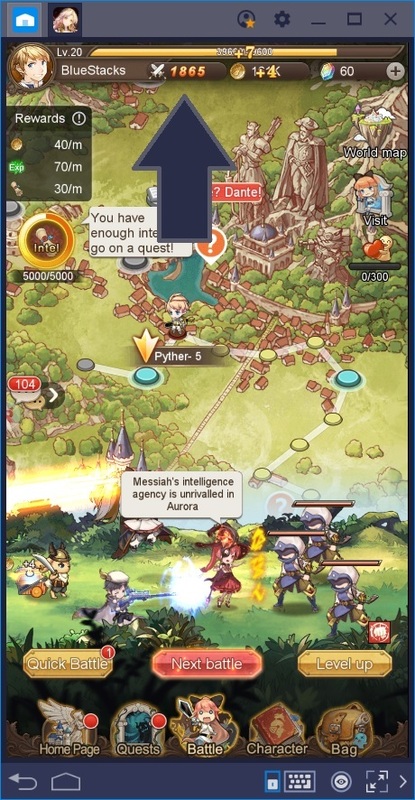 Every battle in Aurora Legend is automated; you don’t need to interact at any time. Your characters will automatically approach the enemies, attack them, and even unleash their skills without having to input any commands. In this sense, you can basically progress through the campaign by pressing a single button and watching your team deal with the enemy by themselves. However, there will be times when you require a certain battle power to challenge further stages or to defeat a tough boss. 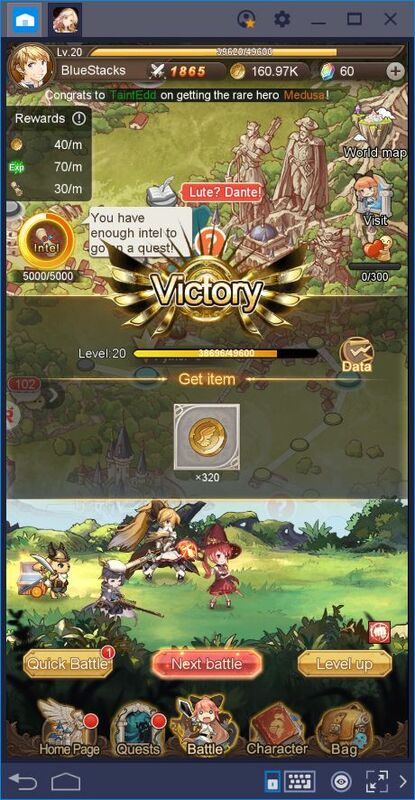 Like in many other mobile games, the strength of your team in Aurora Legend is measured by a single number, battle power. You can find your BP at any time on the top of the screen, beside your avatar. This number is increased by several means such as through the number of characters currently assigned to your team, as well as the levels, gear, and skills of each unit. While the quality of the unit will impact your overall BP significantly, their skills and equipment are pivotal to ensuring your success at any point in the game. In some cases, it’s possible that you’ll run into a wall, be it by a tough fight that you can’t beat, or by a level that requires a certain BP to progress. While the latter is pretty straightforward in what you have to do to advance, the former is somewhat more difficult to address since there are many ways to power up your team. In this sense, even if you have the necessary BP to reach a certain stage, you may still have trouble clearing the said stage if the enemies are too tough for your squad. In other words, a high BP, by itself, doesn’t guarantee a victory. Since this game is mostly automated, you will have to pay extra attention to your team setup and the strength of each unit. As we mentioned in another article, Aurora Legend is mostly about micromanagement; every little change that you implement in your team will reflect on their overall performance. Sometimes, something as little as increasing a few levels to one unit can make the difference between a crushing defeat and an easy win. 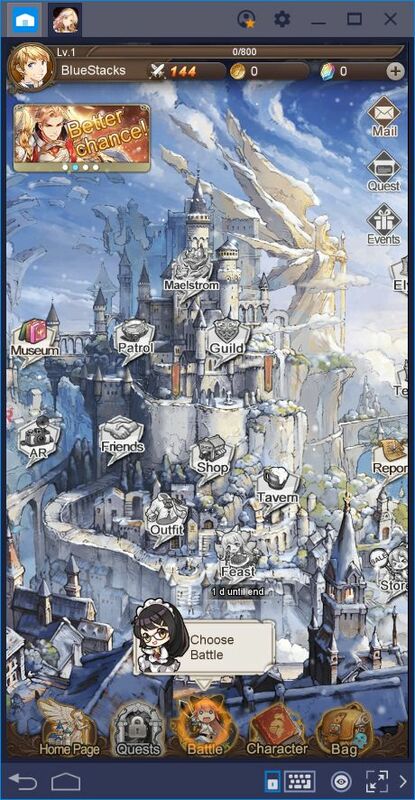 It also helps if you use the proper tools for the job, such as those offered by BlueStacks. 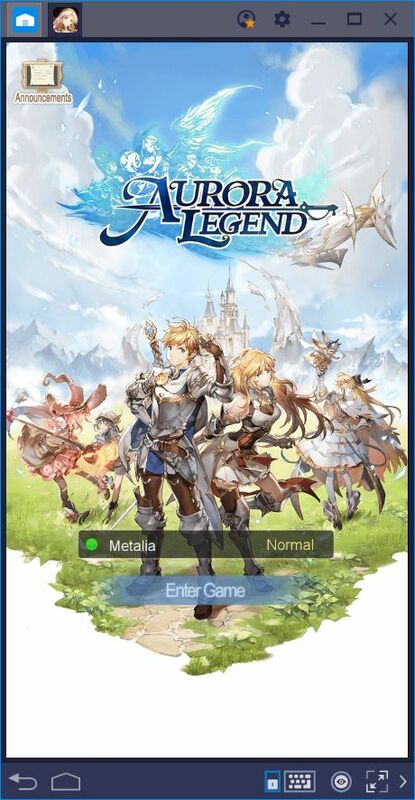 Check out our BlueStacks Usage article for Aurora Legend if you want to best tips to improve your performance in this game. With that being said, it’s important to visit your roster once in a while and use up those experience books that you have laying around. 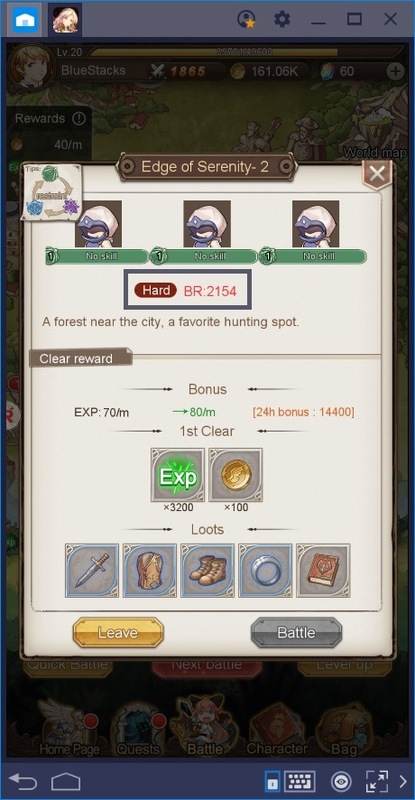 After increasing your character’s levels, you may also check your bag to see if you’ve picked up better gear than what they currently have, and make the relevant modifications. Range: As its name implies, this factor indicates the range at which the current unit attacks. Some heroes are melee while others attack from a distance. The range of your character will determine their optimal position in a team as melee characters should always be in the frontline and ranged heroes should stay behind. Damage Type: This factor indicates the amount of destructive power of a character. Some heroes can destroy their foes with a few swings of a blade and will have a “heavy damage” stat in this category. Meanwhile, other characters won’t be so strong physically and may reflect this on their damage type. Stat Boosts: This is one of the most important factors for any team composition. 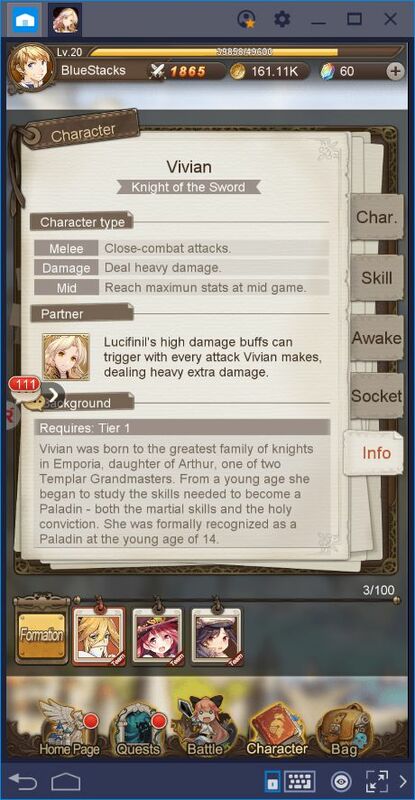 Certain characters receive a stat boost at different times during each battle, which is suggested by this attribute. While some heroes are strongest at the beginning of every battle, others take a little longer to get up to speed and perform best during the mid or late stages of the fight. You can always determine the current battle phase by looking at the turn gauge: it is always green in the early stages, blue in the mid phase, and purple in the late phase. If you want to keep a steady DPS, try to keep in your team characters that excel in different battle phases. You will keep picking up on additional details to improve your team as you progress through the game. However, with the tips we’ve shared in this guide, you are ready to take on every single stage in the game. 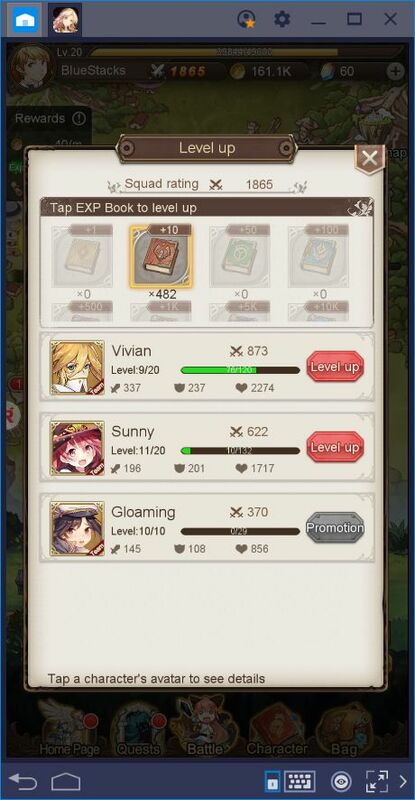 Remember that, every time you’re struggling with a stage, all you have to do is upgrade your current team and let them win the battles for you. Once you’ve adopted this mindset, the game will, quite literally, play itself for your enjoyment.